A SearchOracle.com guest columnist explains how to build an Android mobile application that connects to Oracle JD Edwards EnterpriseOne. Mobility plays a vital role in today’s business. Employees can connect to business anywhere, allow them to make real–time decisions or perform critical tasks any time. Designing mobile applications to meet these needs is crucial -- and it is no different with JD Edwards EnterpriseOne. To design a fully functional integrated application, you need to divide it into two tasks: designing and developing the Android application, and then creating the JD Edwards EnterpriseOne Web services. You can develop a new Android application using Android Developer Tools, which is a plugin available for Eclipse IDE and helps developers create new Android applications quickly. The developer can use these tools to design the front end of the application, which acts as an interface with the user. Developers can code the back end of the application using the programming language. To keep track of the data exchange with JD Edwards EnterpriseOne for audit purposes, you can use SQLite Database, which is a built-in Android feature. Using SQLite Database also helps reduce the use of Internet resources because the user can retrieve the information stored on an SD card instead of going to the JD Edwards EnterpriseOne database every time. Another task in developing an Android app for JD Edwards EnterpriseOne is creating a Web service to interact with the third-party system. You can develop this Web service using either Oracle JDeveloper or the JD Edwards EnterpriseOne plug-in for IBM Eclipse. This Web service syncs the Android app data with work file data created in the JD Edwards EnterpriseOne. The work file can be created in the same format as that of an electronic data interchange work file. Web services can also trigger the new or existing business function to complete the process within JD Edwards EnterpriseOne. Say you have a work table F554801 to store the unformatted data received from the Android application, such as the date and time of a service visit to the customer, the work the service person did and the customer satisfactory index. Using the Web service, you can create a new business function within JD Edwards EnterpriseOne to read and format the data for populating the standard JD Edwards EnterpriseOne tables. 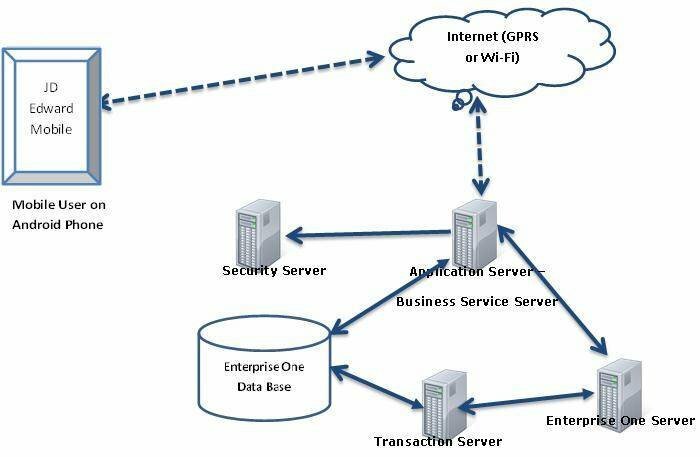 The sample data flow diagram shows where information is passed to and from the JD Edwards EnterpriseOne mobile application to the JD Edwards EnterpriseOne application server. The application server sends the user’s information to a secure server for user authentication. When the user information is verified, the business service can update the database directly or it can use a JD Edwards EnterpriseOne report or business functions to update the database. Suresh Kumar Moda is a project manager in the Consulting and Systems Integration unit at Infosys. He has eight years of experience with JD Edwards EnterpriseOne and has handled implementation, development and support programs.